Oh, there's a bit of a chill in the air these mornings! Definitely time for a bowl of creamy, nutritious, hearty Oatmeal. No, not the instant oatmeal packets that can be purchased and boiling hot water is added. 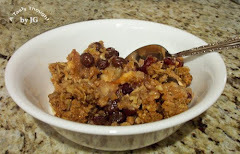 This is the oatmeal that tastes delicious after all of the ingredients are placed in a sauce pot, combined and sit for like 5 - 10 minutes, so the oats may soften a bit, before being heated and stirred. Mmmm! The Quaker Oats canister has the directions printed on the backside, if needed. I also stir in 1/8 teaspoon Nutmeg & 1/8 teaspoon Cinnamon with the oats and milk. 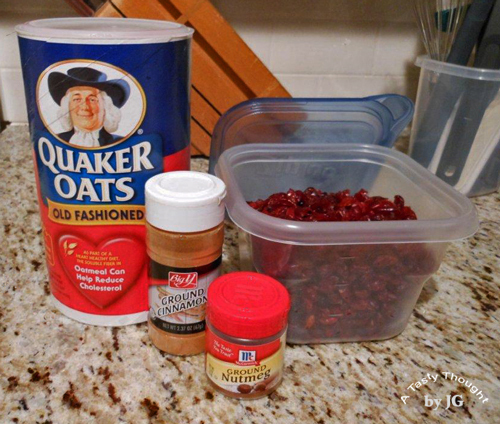 A handful of Craisins (dried Cranberries) add a bit of tang and sweetness to this delicious hot cereal. Brown Sugar (desired amount) is also added. Calcium is an important part of a diet that's needed every day, and a serving of this hot cereal contains 8 oz. - including the Milk added in the cereal bowl. This is a great start to the needed daily amount of Calcium, every day. I use Soy Milk and I find that a half gallon of Soy Milk is always on my grocery list. The Old Fashioned Oats and Craisins will be on my next Costco list! They will be divided into more usable containers, after purchasing. :) There will be more cooking with Oats & Craisins this week! 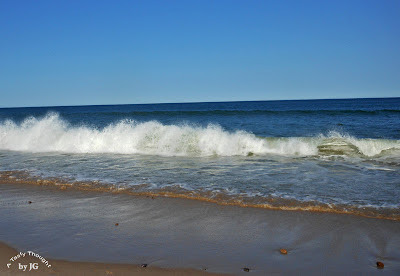 After totally enjoying a few days at the Cape, and I should add not making any really hard decisions other than where shall we enjoy dinner this evening- it's time to think about a grocery list! Oh, that can wait a while longer! 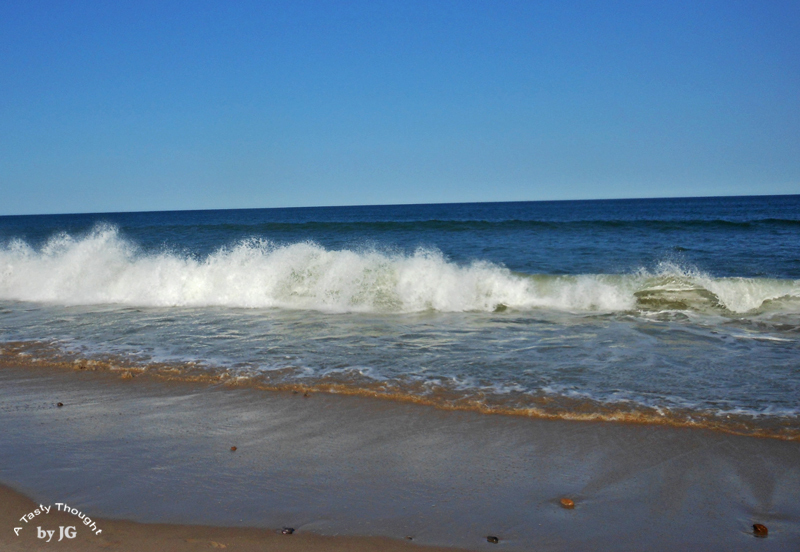 Nauset Beach in Orleans, MA has definitely been a family fave for over 25 years! Walking along the beach choosing stones, sometimes shells to bring back home as treasures is FuN. The sound of the surf pounding on the shore again and again is very relaxing! The salty air smells wonderful. This summer our national news has covered the stories about the Great White Shark sightings in this area due to the abundance of seals (food for sharks). A few seals were swimming closer to shore than we've seen before. As I compile my much needed grocery list, sun dried tomatoes finds its place on the list. I'll also keep an eye out for Flounder in Seafood Dept. at the Big Y. There's a new recipe to try. It seems to be much like the workings of a clock. Every week my Solar Green Tea is brewed on my window sill. A double batch of Yummy Yogurt will find its place on the top shelf in my fridge. 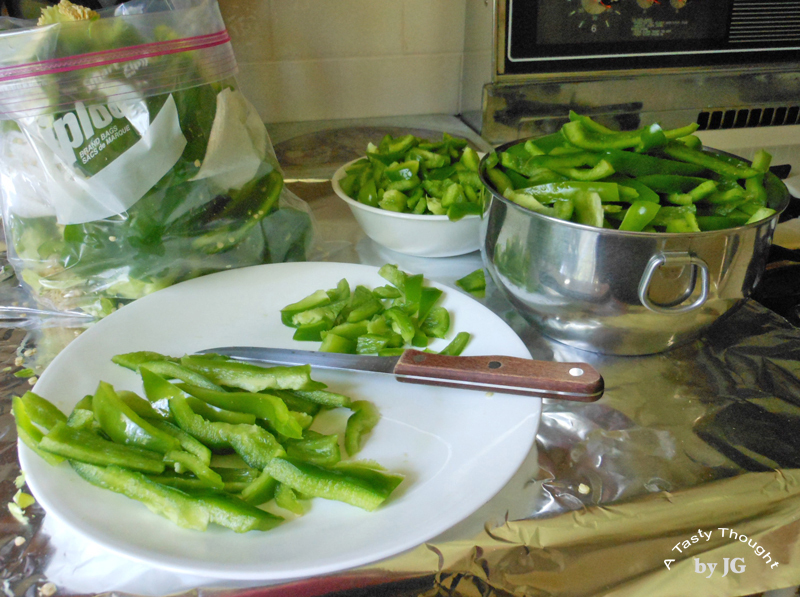 Just after Labor Day every September, (Boston College Football gets my attention and) I remember to freeze the Green Pepper strips. 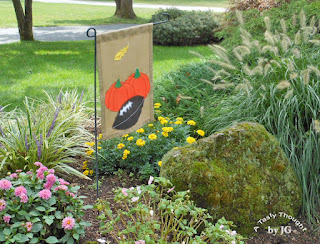 It's like this...it's just that time of year thing! Sure, I could purchase a "fresh" pepper or a bag of the frozen cut pieces in the grocery store, but the peppers are not always firm and the chunks are well... they are small. I went that route last year after the Halloween Nor'easter and results of a 6 day power outage. Yesterday was Green Pepper Day! The purchased local firm fresh Green Peppers were in my fridge...waiting and I was ready for the task! The process is simple! Rinse the fresh Green Peppers under cool running water and dry. Cut off tops. Discard seeds. Each Pepper is cut into strips. A handful of Pepper strips are placed in a plastic sandwich bag. (I do not use exact measurements.) Close the sandwich bag and fold over. Carefully, place all sandwich bags in a Ziploc Freezer Bag. Seal, label and place in freezer. Pepper chunks can be cut off of the tops, so I also had a bowl of chunks to freeze. Quite often in the colder months when I am making a dinner that contains tomato sauce, I'll reach into my freezer for the cleaned Pepper strips. WooHoo! Do you store local fresh veggies in your freezer to use later in the year? They come in handy! 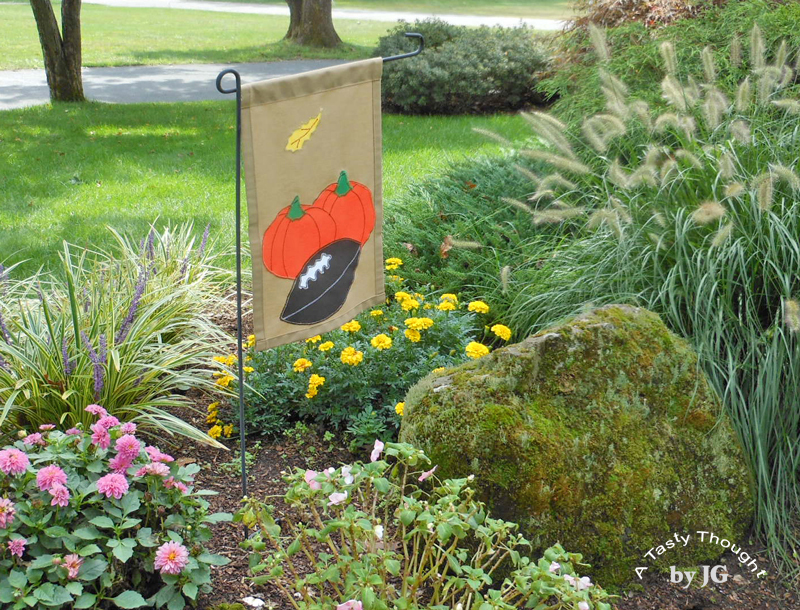 This is a great time of year...the month of September! Not only are the juicy fresh Grapes from CA available in our supermarkets, but the luscious large local Peaches can be easily located/purchased at Farmers' Markets and at road side stands. It took three days for the four hard Peaches to ripen after I purchased them. I placed them in a brown paper lunch bag, closed the top and placed the bag on my counter. This is one week when Peaches will not be used to make a dessert. A fruit salad containing this fresh juicy fruit is just the best! Add in a few slices of just right ripened Banana and a few Grapes and a tasty sweet fruit salad awaits! In the cold winter months I'll think back to the fresh fruit salads that contained no canned (in their juice) fruit. 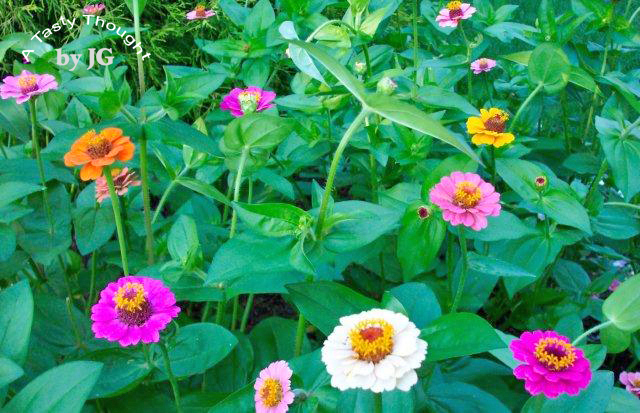 I'll also remember the beautiful Zinnias that grew in our gardens this summer. Soon, it'll be time to save/ dry and then store the Zinnia seeds to plant next spring!